DD changed his tune abit on temperatures after Sunday,as late as yesterday evening he had a high of 48 for Monday,now he has 60 Monday and a cooler 50 for Tuesday with some snow in the NW part of the state.......I'm sure not what Plymouth Weather Lover was looking for.......Randyinchamplin is this the snow you were speaking of or is it further into April. @big daddy...NWS has snow chances for late Monday into Tuesday in their current going forecast,with colder temps then DD. @Big Daddy, I was just going with information available last night. 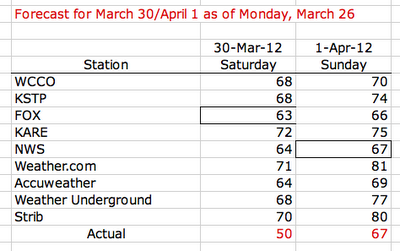 I try to capture everyone's forecast at the same time so they're working with the same available model info. I try to keep it on equal footing, if that makes sense. @Big Daddy, still I'm glad that you've got that documented for us! @Bill I totally get it,I was just browsing PH's forecast and when I saw the 82,I thought it was worth mentioning,I understand the equal footing though. Now wouldn't that be something! 80 or higher on Sunday followed by a snowstorm on Monday night and Tuesday. That variation would rock. So would the snow. Bring it!! I don't believe there is any doubt that we will push or exceed 80 degrees on Sunday. However, the upper level flow finally looks more March-like as we head into next week as the Jet stream starts to sink south and buckles. I will not be surprised if someone in MN receives accumulating snow as we head into the long range (6-10 day period). 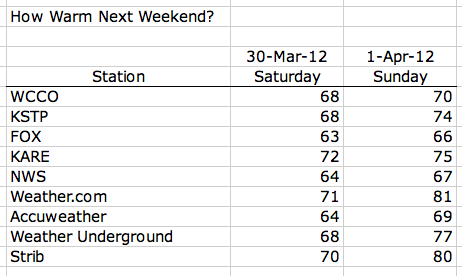 I love the way the set-up looks for next weekend (April 6th - 8th). Snow in the Dakotas & T'Storms/80 degrees in so. MN. Perhaps a true major Spring storm? As long as we remain in the warm sector through the event, I will be happy. I think weather.com and the trib will win out for Sunday's temps, but they could even be a couple degrees too low. Severe threat still needs to be monitored. 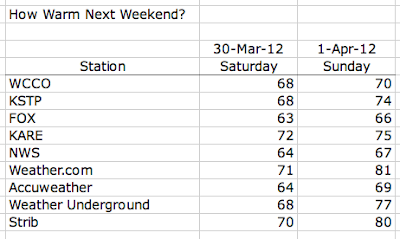 Today's Strib blog headline suggests mid 80s for Sunday; however the text forecast still shows 80. I haven't had time to monitor things lately, but it looks like a big change to my forecast as both the GFS and ECMWF look to take the PNA much more negative than shown just a few days ago, with the NAO still staying negative, this would give credence to what the ECMWF has been showing the past 4 models runs, that is a relatively strong omega block after this Sunday-Tues system gets out of here,(severe is still not out of the question.) If that should happen which I think is likely we will set up under the upper level ridge and see a few days of tranquil weather (different on each of the coast btw.) But as the blocking pattern moves ever so slowly to the east and the western trough tries to get over the Rockies, some fun and games could exist for us between the 6th and the 10th of april. The models are having the usual hard time figuring out what to do with season change let alone the shift from La Ninia to La Nada. This could be a forecasting wrecking ball for the next couple of months. Randyinchamplin--Are you implying a possibility of snow for the 6th-10th time period? Or am I reading into it? The GFS is finally starting to come around to my idea of thinking in the long term. It looked way too cold down the stretch, and those temps are starting to moderate. I personally don't see anything that would give us a big snowstorm anytime soon. In fact, the Euro down the stretch is digging a trough down into the west, which should help a ridge build over us, and put us into a SW flow. This is the same look as what we had a couple weeks ago that gave us our stretch of really really warm weather. The MJO, which has been a big factor in our weather through the winter, is forecast by the Euro to weaken significantly around the 2nd week or 3rd week of April, after passing through phases 8 and 1 (8 is warm for us, 1 is cool). Since this has been such a driving factor for us, I'm gonna stick with it for now and expect our temps to get a bit warmer the first stretch of April, before cooling a bit around the middle of the month. After that, well it is anyones guess. CPC does have April being above ave. for temps, so I wouldn't expect that cool down to be that dramatic. Again, this is my very uneducated prediction. PWL you got to give up on the snow man,your reading way into it,there is no cold around anywhere that would support any snow going out thru mid-April,think snow by November again,in the meantime enjoy spring and summer because its here in all its glory,by Sunday you will have the central air by then maybe it will be cold enough in your home to support snow. Oh well. I love warm weather so the snow can wait until next year. But a late (in April) snowstorm would be fun. Let's set that record, too. I just read a good article written by Paul Douglas that appeared on Huffington Post .com, it's a pretty good read. To present the other side of the argument look in the comments section here to read Joe Bastardi's response. Holy Cow. Are you kidding me? I usually read his blog, but I did not read it for today. I will be dancing. Latest, biggest snowstorm would be awesome. Bring it! Yeah, in my opinion the chances of that happening are, again slim. We just need to "survive" this little cool stretch we have coming up, because I still see the MJO weakening after passing through its cool phase and the other oscillations heading to a warm phase leads me to believe we will finish out April quite warm. Moisture is sure becoming difficult to come by and it doesn't look like we'll be seeing anything significant over the next 7 days. Make sure to check with the local government bodies about burning bans before burning anything. Sunday is a day where the fire risk could be enhanced over the next few days. There are already Fire Weather Watches up for parts of MN, but it wouldn't shock me to see that area expanded to the east over the next 24 or so hours. Temps won't be all that warm, but dewpoints should be low enough, and wind speeds high enough that it could warrant at least some type of fire watch. Soundings look really well mixed on Sunday (NAM is mixed up really high which would really drop dewpoints way down into that low 20, maybe even upper teen category). Since it's really the only weather we have to talk about over the next week, I figured I would mention it. 500mb trough setting up over the eastern portion of the country, we will be on the western edge of this, mean while a strong surge of cold Canadian air will work its way into the area underneath said trough. We all expect the next couple of days to be cold. By Wednesday night the eastern trough should start to move off shore, while in the mean time a massive trough will enter the western part of the country pushing the Canadian High off to our east. That will put us into a nice return flow by Thursday morning bringing a warm up to the area. At the same time a piece of energy will break off from the western trough and a low pressure area will form underneath it over Montana which will move towards the Upper Mississippi River Valley. Expect increasing southerly winds during the day on Thursday with a chance of showers. A chance of rain again on Thursday night and Friday with a chance of thunder on Friday. By Friday night as more of the trough digs into the SW US expect a secondary area of low pressure to start to form near the CO/KS border. Buy Saturday morning into the afternoon it will deepen to our sw to form a sub 1000mb low (some GFS ensemble members show a sub 990mb low.) The area of strongest instability with strong sheer values will set over the MN/IA border. While the Storm Prediction Center is strongly hinting at a 30% risk of severe weather poking it's nose into sw IA, they do mention the Upper Mississippi Valley in their text disco. So as Friday and Saturday approach you may want to pay a little closer attention to the forecast. If storms are predicted what mode will they take? You may want to do a little digging yourself. The Euro pokes the severe threat for Saturday further into Minnesota, but it will be interesting to see if we see enough clearing to destabilize things. I think the SPC should extend their Saturday outlook further up into Iowa, at least into central IA...perhaps a bit further north. The central and southern plains are looking quite active come the end of the week and into the weekend. You do really have to love how the models like to toy with us as we get deeper into spring. GFS and Euro both are hinting...and only hinting at maybe some snowflakes flying Monday night and Tuesday morning. I am still not completely sold on this happening, and even if by some chance it did, surface temps should be more than warm enough that it would be tough for anything to accumulate. Even if this did for some reason happen, I'm sticking with the month ending on a warm note. Plymouth Weather Lover are you dancing?,the bring it dance......the NWS now has snow mentioned as close to the metro as St. Cloud for Monday night...still way out there,but models are wobbling and we always like the Euro and the Euro is the one that has colder temps with snow near the metro....interesting times indeed!!! @big daddy another interesting note wunderground has 60% chance of snow for Monday night calling for one inch and a low of 30........surprise surprise! Clear with a chance of snow. Low of 32F with a windchill as low as 25F. Winds from the NE at 10 to 15 mph. Chance of snow 40% with accumulations up to 2 in. possible.